Getting your yogi just the right present for Christmas, Birthdays or Valentine's Day can be tough. I've created several pages to help you get some ideas. Are you looking for some Yoga presents that you can give to someone on your gift list this year? Perhaps you do not go to a class yourself and are not sure what a good gift might be. Yoga can be a way for people to get some good exercise but it can also be embraced as a part of a person's lifestyle. Chances are you are looking for a gift for someone who attends a Yoga class on a regular basis. There is not a lot of equipment that is needed when one participates in this form of exercise but there are some helpful items that you can give to a friend or family member that will be both functional and much appreciated. The nice thing is that you can find appropriate gifts that are not going to cause a strain on your budget and give the person something that they will find useful at the same time. Let's take a look at some ideas that you can consider. The best yoga mat bag around! But let me start with the Hotdog Yoga Rollpack by Skooba Design. Yoga mats are unwieldy things. Mine rolls up with a strap that I can also use to carry it, but it would get dirty if I used that system on the street. 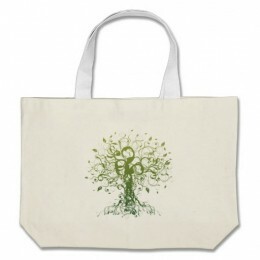 There are yoga mat bags around, but they usually consist of nothing more than canvas and a strap. Isn't that all you need? I would have thought so till I saw this bag. As you can see, this bag folds out as a flat cloths rack bag which you can hang in your closet during the week. Your yoga cloths will stay nice and flat and won't take up too much room. Then when it is time for your weekly class you roll up the bag around your yoga mat, put your accessories in the pockets, fill the water bottle for a quick sip when you're parched and you're out the door. The design is flexible enough to have room for a yoga towl as well, so you can simply carry all your gear in this one bag. Not shown, but yes, there's as shoulderstrap as well. Isn't this just the smartest yoga bag you have ever seen? As you can see, there is room for all your essentials - phone, keys, water bottle and more in the extra pockets. More cool and creative yoga bags! 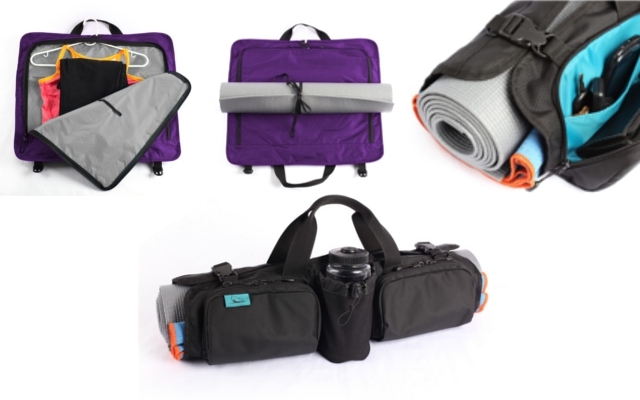 From yoga backpacks to shoulderbags and yoga mat bags with zipper. Personally I think that giving a tote is a wonderful idea for anyone who goes to class once or more a week. It allows them to carry the items they will need while they exercise in one convenient bag. They can carry their mat, a towel, water bottle, pair of socks and maybe even a change of clothing for when the class is finished. Everything is all in one place and easy to find and carry. Typically a Yoga class will last about one hour and during that time some of the exercise can become pretty intense. The student will most assuredly work up sweat with some of the poses and activities during that hour. Giving him or her a present of a water bottle that they can take with them is a thoughtful idea. It can be filled with water before they leave home and carried with them to class. When they reach a point where they are finding that they are sweating from the body heat generated from activity they can hydrate themselves quickly. It will also come in handy after class to replenish the water that their body has lost. A yoga statue makes a great gift. The yoga figurines on this page usually show the kind of back bending asana that has come to symbolize yoga in the common mind. Beautiful and austere. Can you do them? These make great gifts and talking pieces. 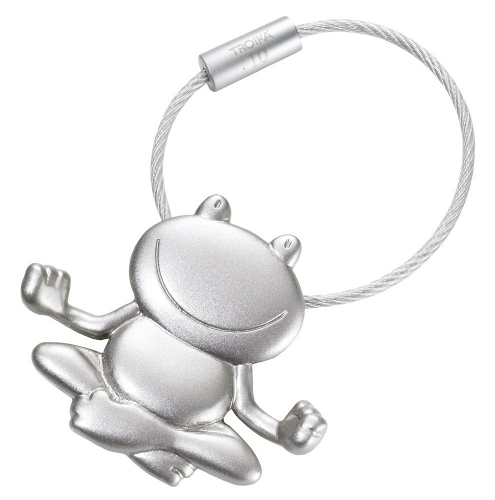 Don't you love these yoga frogs? 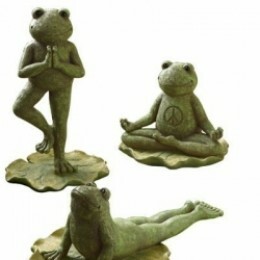 Unfortunately this particular set by Grassland Roads is no longer available, but there are loads of yoga frogs statues available still. Yoga has some really beautiful Asanas/Poses. These have been depicted beautifully by many artists over the past centuries. Gifting a Yoga sculpture is a great gift people for Valentine's Day. 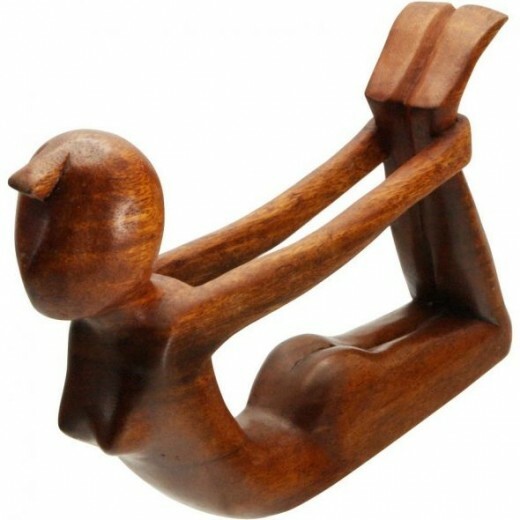 Even if your Valentine is not into Yoga - he/she would certainly appreciate the beauty of Yoga sculptures. Hand Carved Bow Pose Yoga Statue, Indonesia. Made of red Suar wood. The Bow pose gets it's name from an archer's bow (Dhanu in Sanskrit, hence Dhanurasana). You'll feel the tension in your arms, back and shoulders. Adho Mukha Svanasana or 'downward dog' is perhaps one of the most famous yoga poses. Don't you like that name? The Downward Dog is part of the Sun Salutation sequence that many people use as their daily yoga routine. 10 inches wide statue made of Suar wood. There is really no need for a student to have real specific clothing when doing Yoga exercise but there are things to keep in mind. Their clothing should be loose fitting to allow for the movement that they will be doing. A loose t-shirt that is long enough to hide the midriff when their arms are held above their heads. Loose fitting or workout style pants are good for them, also. In fact, at home I do my morning yoga in my pajamas! A nice option for a person to have is a zippered sweatshirt. They may start the class out wearing one and then can remove it once their body temperature rises from their activity. It can then be put back on after class when their body starts to cool down. Although it is best to do Yoga in bare feet, a pair of non-skid socks is a nice option to take to class. They keep the feet warm and there is no risk of slipping as their would be with ordinary socks. This is not an article of clothing but does come in handy. A microfiber towel to wipe the sweat off of the forehead and face when the exercise becomes intense. It can also be used as a pillow during meditation if it is rolled up or can be used to cover the eyes during meditation if they want. The advantage of microfiber over ordinary cotton is that it is very lightweight, and dries fast. Both excellent qualities if you're on the road before and after class. Yoga has a strong association with Indic religions like Hinduism, Jainism, and Buddhism. 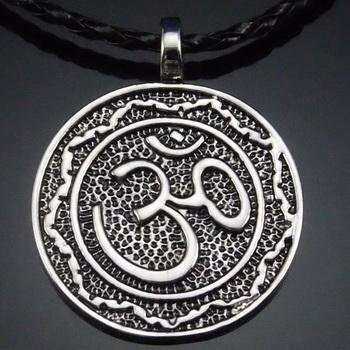 There is a cool range of Yoga Jewelry available which can be gifted on Valentine's Day. Be it the Aum symbol or Lotus - you'll find many beautiful designs which will mesmerize your Valentine. Take your pick from the vast collection of Yoga Jewelry. Perfect gift for people practicing or considering taking up Yoga to improve their Spiritual and Physical lives. According to the philosophy of Yoga - there are 7 energy centers called "Chakras" and they parallel the spine. Each chakra has certain qualities and associations. And there are yoga postures that help us get this energy in balance. Certain Gemstones are said to be beneficial for these 7 energy centers of the body. There are cool Chakra Gemstone Bracelets available which can help you look good and awaken the Chakras at the same time. Enjoy a fun-filled relationship - gift your Valentine a Chakra Gemstone Bracelet this Valentine's Day. Funny and charming key chain that makes a fun small gift for parties or Christmas Stocking. Is it all about being flexible? Certainly doing Yoga exercise requires that we begin to be more flexible but that is not all that it can do. By the way before I explain the other possible benefits, I have a little bit of a tip on flexibility. You might think that this form of exercise is not for you because you are too stiff. The stiffness actually begins in your brain and not your limbs. Get rid of the fear of flexibility in your mind and your body will begin to be able to do those poses you thought were impossible. Besides giving your body more flexibility Yoga has also been studied for other benefits. The risk of heart disease is lessened considerably because as you exercise in the Yoga way you increase the arterial flow in your body. Cases have also shown that this type of exercise helps with high blood pressure, diabetes and asthma. What do I give my Yogi? 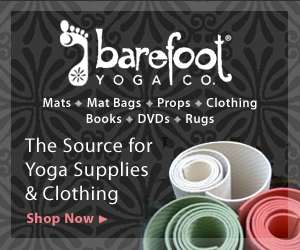 Are you looking for gift ideas for a Yogi that is a part of your life? It is most probably your Yoga instructor that you plan to give something to at the holidays or perhaps his or her birthday. They are often referred to as Yogis because they are a practitioner of Yoga in their lifestyle and teach others about the physical, emotional and meditative methods used in Yoga. It is difficult to find a gift for an ascetic yogi as they have often made the decision to abstain from worldly pleasures and concentrate most of their time in meditation. Let's see if we can find some gift ideas for your instructor or Yogi. A comprehensive overview of yogic traditions in India, including a traditionalist interpretation of Indian religious history. Mark Singleton looks at the history of modern yoga, i.e. yoga exercise, in the context of the cultural history of India as well as the international body building and exercise movement. Like so often, it turns out cultures are less independent than they look. Your Yogi can decide what they would like to keep in their journal. It might be things they want to remind themselves to let go of, it might be the progress of students in their class, or it could be just anything they want to write about. What I like about this one is not just the OHM sign on the front. It is an eco-friendly produced book with recycled paper that allows trees to continue to populate our forests and provide oxygen for us to breath. There are 160 pages for them to write or record their thoughts, hopes and dreams in. OM at Home is a journal/beginner's guide to yoga with stick figures to help with the yoga poses. Writing prompts and room for notes and reflections make this a great journal. Hatha Yoga Classic by RamacharakaThey might really enjoy this book about the philosophy of Hatha Yoga which concentrates on the physical well-being of our bodies. That means more than just exercise and the book gives good advice on how to reconnect with nature and become a healthier person both physically and emotionally. The reader will come to a better understanding of the practice of Yoga and the need to remove so many of the artificial items and ideas out of our lives. It is not in any way a new philosophy but instead a reminder and invitation to come to a better life in a physical and spiritual way. NOTE: there are several versions available. This one doesn't have reviews yet, but does have a positive publishers statement that they took care with the way they printed this. Other versions have customer reviews saying the text was reprinted so badly that it became illegible. This goes for both print and ebook versions. The latest trend in yoga is that it is finding it's spiritual roots again - mindfulness and yoga are being combined. That is good thing - if there is one thing I have trouble with in the Western Yoga tradition, it's that it can be pretty harsh. This goes back to the main founder of modern 'Mindfulness', Jon Kabat-Zinn, who made mindfulness yoga a central part in his MBSR (Mindfulness Based Stress Reduction) program. Integrated in a yoga practice, mindfulness helps people to be kind to their bodies and respectful of their (physical and emotional) boundaries. Because modern life is so very busy, so full of sensory impressions from the internet, tv, music, traffic etc. Although the practice of mediation does not belong solely to the practitioners of Yoga, it is often a part of it for many. Perhaps it comes from that strong urge in us to know ourselves better. We find the need to get to a place where we can understand our true nature and where we fit into the universe as a whole. A calendar that has inspiring and motivational messages while keeping our daily lives on track physically could be really helpful if we have chosen to pursue a more tranquil way of living. Not only is Yoga good for our body and mind, it also shares a deeper Spiritual resonance with Valentine's. Yoga literally means "to unite" or "to become one". What better way to celebrate this Valentine's Day than by gifting your partner/friend/spouse a Yoga gift. Become one and remain united for the rest of your life. Practice Yoga and remain healthy and stress free. 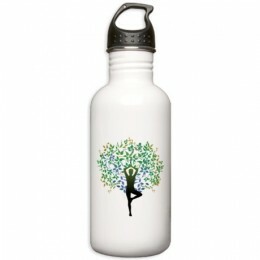 Please take a look at our collection of Yoga gifts for Valentine's Day. The love of yoga shines through on these beautiful yoga posters, from art to photographs portraying yoga poses to real yogis showing off the most complicated asana's. A unique yoga mat is just more fun during yoga class, don't you think? I've found you cute and beautiful yoga mats, but also more rough and wild ones. 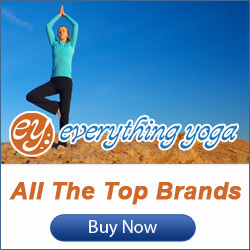 These extra thick high density yoga mats are Phthalate Free and available in several colors. Nice and thick to help them not to slip around when exercising and they come in a nice variety of colors. To inspire your practice, this calendar contains twelve beautiful color photographs of yoga practitioners demonstrating advanced asanas, along with quotations from master yoga teachers... See also these yoga desk calendars. Maharishi Mahesh Yogi became the spiritual leader to the Beatles for a while in the 1970s. He is most famous for his teachings of Transcendental Meditation techniques. It was reported at the time that their time with the Maharishi helped them stop using mind altering drugs and put them in a better frame of mind to write new songs. People from all walks of life have learned and practice the style of meditation that the Maharishi taught to many famous people along with people like you and I. TM as it is often referred to is normally practiced twice a day for 20 minutes at a time. A single mantra is repeated during the exercise and there are different mantras for a variety of needs. More about the history of yoga as a spiritual practice. I've started out of course with spiritual gifts, but there are also calendars, laptops, iPads, Harry Potter gear etc. It's all stuff I have bought or would buy if my house room and pockets were infinite. They're not and that's OK. See also my new gifts blog.